Lift your Drift car with a push of a button. The ultimate Drift car accessory. Easily change your wheels at the track. Bolt in kit, only takes 10 minutes to fully install. Ships in approx 3 weeks. This is a NUMBERS LIMITED, discounted pre-sale. More info in the description. Bolt in kit: only takes 10 minutes to fully install. Engineered to lift and lower your Drift car electronically, with a push of a button from its remote control. Lifting the rear of the chassis takes approx 22 seconds. This enables you to easily change your rear tires. E-Lift will lift the rear of your car only. The E-Lift is IP66 certified (water & dust resistant) and is rated for 800kg lifting capacity. The lifting arm has a stroke of 220mm (22cm). E-Lift will lift your s13, 220mm: measured from the ground to the rear lowest part of your s13’s differential. To check if E-Lift will work for you – Jack your car and once your rear wheels are off the ground. If the height is lower then 220mm then E-Lift will work in your vehicle. Contact us if you have questions. E-Lift is powered from your vehicle’s battery or 12v power supply. No extra lines, wires, batteries are required. E-Lift power regulator, wireless receiver box + electrical connectors. 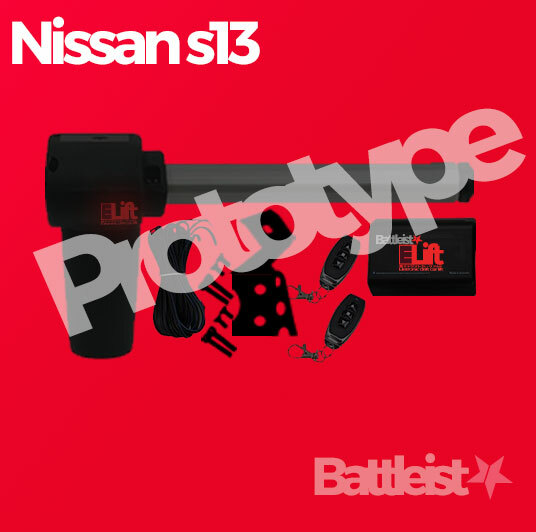 This kit is applicable to Nissan s13 Chassis only – please see “Install” for more compatibility info. This it will not suit any other chassis. Other chassis coming soon! S14/s15 & other chassis (Skyline, 360z, JZX, FT86, etc) E-Lift kits are in development and will be available for sale soon, dependant on demand. If you want an E-Lift for your car, support us by sharing this product with owners of s13’s. Let us know if you want E-Lift in your car and what chassis it is! Please read the information on “PRE-SALE” tab for all information regarding this sale! E-Lift bolts to your s13 chassis on the back of the rear subframe. E-Lift’s s13 brackets use the factory diff cover attachment points, to bolt its bracket to. These can be from an s13 subframe or if you’ve swapped in a newer s14/s15 subframe, we have a bracket for that also. Please select the correct diff/subframe option when ordering. This version of E-Lift will work with 2 or 4 bolt S-Chassis subframes. If your s13 has a different subframe (custom) or a modified (extended) diff hat/cover, we can not guarantee that this E-Lift kit will suit. Ask us if unsure. We are planning to develop E-Lift kits to suit most popular drift setups. Get in contact to discuss your drifting setup. 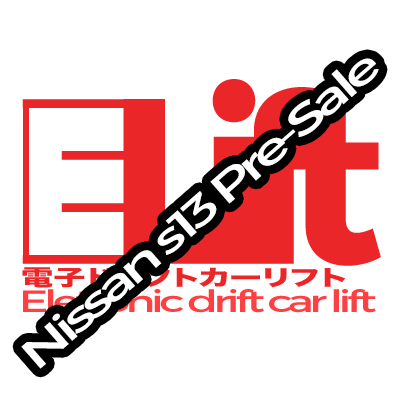 E-Lift was designed on a JDM spec, 1996,180sx sr20det. It is lowered on coilovers, with 18 inch wheels, and 235/40/18 tires. While we believe most s13 varients ( USDM 240sx) with a 2/4 bolt rear hat, will suit this E-Lift kit, we, however, can not guarantee correct installation as we have not installed in every s13 variants. Check the “Compatability Checklist” tab to check compatibility to your vehicle – Refunds may be possible but not guaranteed if this E-Lift kit will not bolt into your s13 – get in contact to discuss. E-Lift comes with all wiring and an electronic box to power and control its electronic actuator. Minor electric instal is required. A detailed guide is included. You can either power E-Lift from your s13’s battery or from a switched 12v power source in your s13. 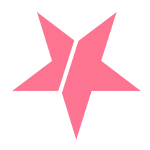 E-Lift is currently not in production, however, if we achieve 20 pre-sales (this product you may purchase), it will give us the confidence to produce this product. Approximate time for shipping your production s13 E-Lift is 3-4 weeks from time of purchase on this pre-sale. If we do not pre-sell 20 E-Lift kits, we will fully 100% refund your purchase amount – including shipping and any GST, using our secure payment provider using the “refund” facility provided. If we achieve 20 pre-sales or more: The E-Lift will immediately go into production and we will start shipping E-Lifts as soon as possible. You will be the first to be shipped an E-Lift at a never to be repeated discounted price. Your support will help us produce this product. 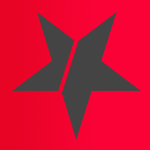 We will advise the status of the progress of the pre-sale through our social channels. If you have any questions, we are happy to answer via Facebook or email. E-Lift is for off-road, racetrack use only. A detailed install and usage guide is included in the E-Lift kit. E-Lift is designed for you to change your wheels, and not for you to perform any other tasks where you may be under or obstruct the vehicle in any way. There is an inherent danger with lifting vehicles using any lifting system. Please respect all risks, use your best judgement and always stay safety conscious. Never ever get under or partially under a vehicle supported by E-Lift or any other vehicle jack. Always use correct safety equipment when working under your car in any circumstance. Mis-use or incorrect installation of E-Lift may cause injury or death. Use at your own risk. Here is a checklist to determine that this E-Lift will work in your car. s13/s14/s15 R180/ R200 diff cover/hat with 2 or 4 bolts. 220mm from ground to bottom of your diff or less, to raise your wheels off the ground. Suits lowered cars with coilovers with minimal sag.